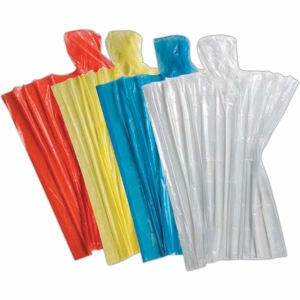 Coming soon....Biodegradable emergency rain ponchos. Our biodegradable ponchos or eco ponchos are made from 100% organic matter. These rain ponchos are durable enough to be used, reused and then recycled as they are naturally biodegradable and compostable in the presence of sunlight, moisture, micro-organisms, oxygen and soil. Like a fallen leaf it will disappear over time and leave no harmful residue in the soil. Resusable, lightweight, and waterproof 100%. We offer both plain and printed bio degradable (eco-friendly ponchos) subject to minimum order quantities. Please contact us for availability and prices. Free delivery on all UK orders over £10!